Acrylics are one medium that always seem to get the better of me, I find they dry too quickly, I struggle to blend them and I never quite get the same depth of colour as I do when using oils. Having been gifted a nice starter set of acrylics this year I decided that I would challenge myself to test them out yet again. 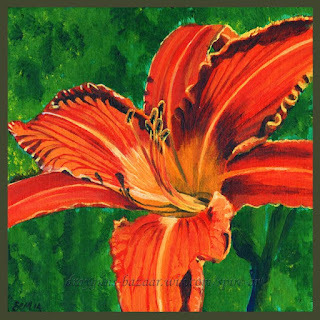 This post therefore begins with my 2014 acrylic attempts and ends with the oil paintings that I created in tandem. I’ll start with the experimental fantasy one below, the idea of this piece was to try and give a sense of texture and light. I don’t think I captured the water very well but the overall feel of it works. 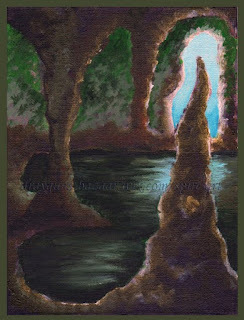 I tried using gloss medium in the paint (which doesn’t show up well in the scan) to selectively add sheen to the rocky parts of the image. The next two were created for an art show that had the theme of shoes. 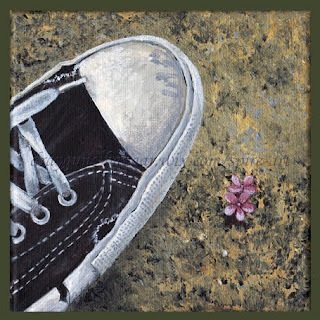 The above was painted from a photograph of my husband’s imitation converse. I really like the image because of the juxtaposition of the teeny tiny flower on the beach and his huge feet. To be fair the flower was incredibly small, perhaps 1 cm in length and he almost stepped on it before I spotted it! That gave me the idea to take the photograph and I think the composition lent just as well to this painting. Next up, below is another fantasy type piece. I wanted to test out a touch of the gold and iridescent paints in my gift set and try working on a tiny scale. 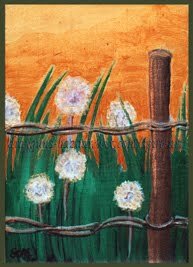 This was painted from a memory of the glowing dandelions out the back of our house in Winfield. I’m not certain how successful it was but boy I regret going small on this one. Lastly for acrylics this year I decided to have another go at painting flowers. We have a lot of Day Lillies out the front so it seemed a natural choice to go for something bright and bold that I had a lot of reference material for! I did work from a photograph and initially wasn’t happy with the final of this piece. It has grown on me over time, now that I have forgotten all the things I wanted to change when I first finished! 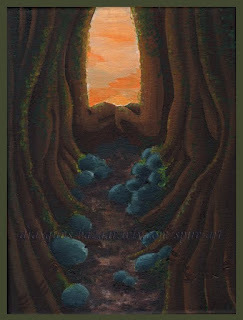 I started off my oil paintings this year with a similar theme of fantasy. I wanted to attempt something with a nature theme that might also be a touch surreal or magical. The above Nature’s Hold; I returned to painting trees with shapes in them. 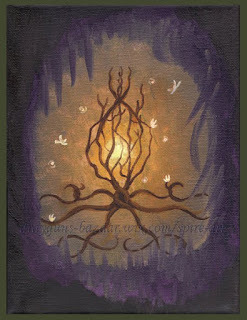 Perhaps a little too subtle here; the roots are meant to resemble fingers digging into the earth. With the below Tree Spirits, I decided I wanted to created something a touch more ethereal and delicate. I like the idea of keeping the brightness in the center and the edges dark to draw the viewer in to the center of the painting as if the tree is well hidden in a secret place. The below ‘Into the Blue’ was also created for the shoe themed show. 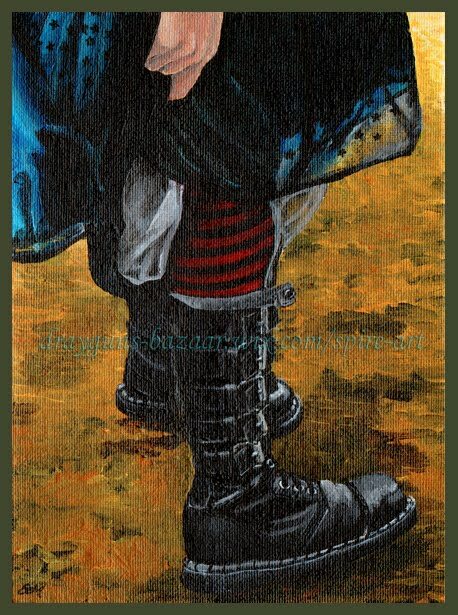 I had the background of this painted for quite some time but wasn’t sure what the subject should be. I decided to keep the colour palette as limited as possible. Since the painted background made me think of water I decided to add a boardwalk, the figure and boots came later. I like the idea that this can be interpreted as the viewer sees fit. I wanted to make it ambiguous as to whether or not the figure is actually there or merely a ghostly echo of a person that once was. 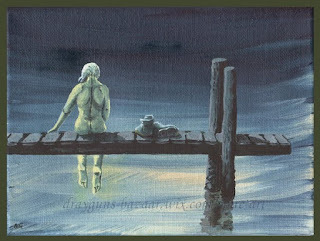 The figure could be a person skinny dipping, a person contemplating the end of their life, the ghost of a murder victim or the specter of someone who just really loved that place. I tried to make the boots on the pier more solid and physical looking which I think aids in making the figure more spectral in appearance. I also wanted to set the shoes aside from the figure so it is unclear whether they belong to the person on the jetty or have just been left there. I’d be interested to read what others make of this piece! The background for the below painting was created in one short sitting and felt surprisingly liberating and freeing to complete. 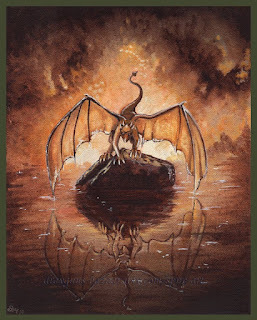 The subject of the dragon on the other hand was a painstaking endeavor to finish. 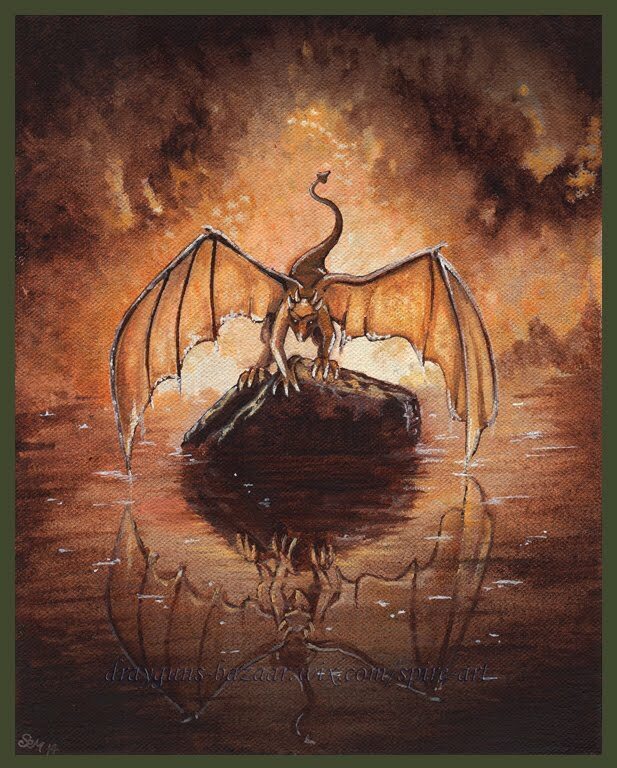 Being fascinated with reflections I really wanted to give the impression that the dragon was studying itself in the water. Once again I decide that keeping the colour palette very limited would work best and despite fighting to get the reflection to match I think I am pleased with how this one turned out. Last but certainly not least is the below White Tiger. This piece pained me a great deal. 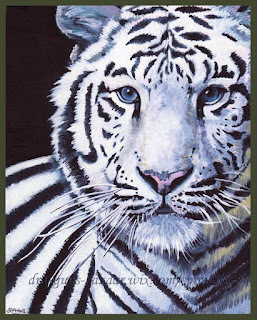 I chose to try and paint it to get more practice painting white subjects since I find white a tricky colour to render. White is after all, not white at all. I experimented a lot pushing and pulling subtle blues, pinks and yellows to try and achieve a white that wasn’t flat. I think I did reach my goal in the end however this piece went through at least four under-painting evolutions and a lot of cursing lol. I’m glad I stuck with it, however I think it might be some time before I brave another all white subject!